Due to information asymmetries between the debtor and potential outside investors, entrepreneurs often face sizeable and insurmountable financing constraints. This is a strong deterrent to either starting new or continuing already ongoing innovation projects which not only stymies entrepreneurs’ own future innovation potentials and growth prospects but also severely harms growth potentials of whole economies, making catching-up an unnecessarily long and arduous process. Against this backdrop, the analysis sheds light on the effects of prevailing credit constraints on different innovation strategies (i.e. R&D-based make versus M&E-based buy strategies) of establishments in Central, East and Southeast Europe (CESEE) and the Former Soviet Union (FSU) during three different economic phases. The results point to the detrimental effect of credit constraints which is particularly strong and consistent for the M&E-based ‘buy innovation strategy’ which dominates in the region, but less pronounced and relevant for the less prevalent R&D-based ‘make innovation strategy’. 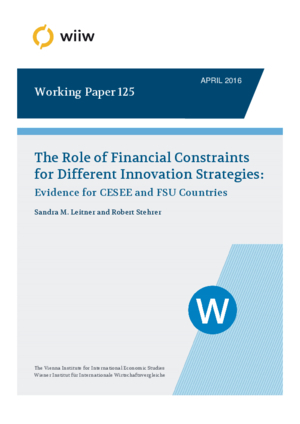 Furthermore, the analysis identifies firm characteristics that are conducive to innovative activities and demonstrates that establishment size, age, the particular international trading status, ownership status as well as whether subsidies were received are important determinants of different innovation strategies.